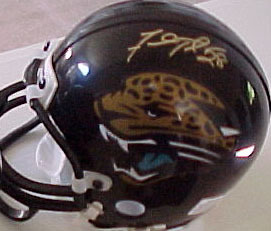 Jacksonville Jaguars mini helmet autographed by former star running back Fred Taylor. Authenticated by Real Deal Memorabilia, with their numbered stickers on the helmet and certificate of authenticity. ONLY 2 LEFT.